Sorrento is a town in Campania that has beautiful architecture and a quaint atmosphere. There are many great cafes and restaurants in town where you can pass the time. There are also great shops and activities that appeal to all types of tourists and travelers. Sorrento is on the Circumvesuviana rail system so it's easily accessible from Naples. 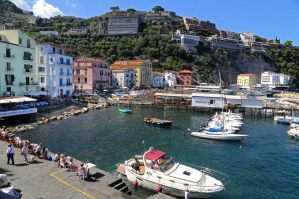 It's a popular place to base yourself while you're exploring the area and there are also ferries that go regularly between Sorrento and Capri. 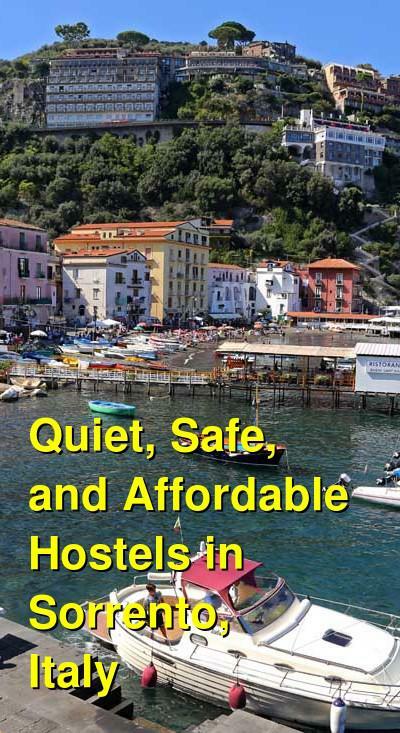 There are a few great hostels in Sorrento. Some hotels also offer dorm rooms, which make a good option for budget travelers who don't want to spend a fortune. Several affordable options are listed below. Florida Hostel and Hotel is a resort that has both dorm rooms and private rooms available. Every room has air conditioning and a private bathroom attached. The facility also has a beautiful garden area, a swimming pool, and a bar where guests can hang out and relax. There's a relaxing atmosphere, but it feels a bit more like a hotel than a hostel, with most of the guests staying in private rooms. It's centrally located though and great for exploring the town. This hostel also makes a great base for exploring the Amalfi Coast including Capri Island, Positano, and much more. They offer all of the standard amenities for guests including free wi-fi access, security lockers in dorm rooms, and luggage storage. There is also car and bike parking available and discounts to different clubs and activities around town. Guests can start their day with a full English Breakfast every morning (for an additional fee). There are also pizza nights in the garden area every Thursday night where you can meet other guests and enjoy a good cheap meal. This is a great option for visitors to the Amalfi Coast who want to meet other guests in a fun setting. A great hostel for backpackers, couples, and female travellers. Seven Hostel is another affordable place to stay near Sorrento along the Amalfi Coast. It's a popular option for backpackers and budget travelers who want comfort and affordability. The hostel is located in an eighteenth century building and there's a modern design but it still holds on to a bit of its history. In the surrounding area you'll find some great walking paths and swimming areas. There are also several great sun decks where you can relax and soak up the sun. Also nearby you'll find several great restaurants, bars, and clubs. If you don't want to go far, there's also an on-site bar where you can grab a drink or a bite to eat. The hostel has double private rooms available as well as six, eight, ten, and twelve bed dorms. There are both co-ed and female only rooms to choose from. The rooms are kept very clean and the staff are friendly and respectful. A good hostel for backpackers, budget travellers, and independent travellers. Ulisse Deluxe is another popular option in Sorrento. It's located near the historical center of the town and is about half a kilometer from the main square and Piazza Tasso. It's also very close to Marina Grande, the fishing village. This hostel makes a great base for exploring the historic town and the surrounding countryside. It offers easy access to many nearby destinations including Capri, Pompei, Ercolano, and most of the Amalfi Coast. The hostel is housed in a modern building that is well decorated and has all of the modern comforts you might need. There's a great bar area where guests can hang out, a wellness center, an indoor heated pool, and a full gym that guests can use. Ulisse Deluxe has the feel of a hotel with a few dorm rooms attached, so the atmosphere isn't as social as you might hope. Most guests stay in private rooms but if you're in a dorm, then it's relatively easy to meet the other dorm guests. The hostel has private double, three, and four bed rooms as well as six and eight bed dorms. The six bed dorms are male only and the eight bed dorms are female only.